Edged with a sassy ruffle and featuring extra long ties, both sizes cn be worn in many ways. A simple pattern of 3 rows of stockinette alternating with 3 rows of reverse stockinette creates the ridge pattern. Instructions are given for the following two sizes - 17 inches deep by 70 inches wide at top edge or Large 21 inches deep and 102 inches wide at top edge. Yarn requirements - 450 (850) yards of DK or light worsted weight wool. 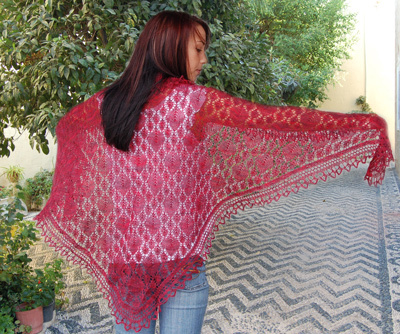 This shawl is knit to a gauge of 13 sts = 4 inches.